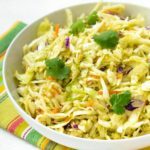 Make Hatch Chile Cilantro Slaw for a spicy side dish to serve with seafood, pork, chicken, and more. Use it as a topping for hot dogs or in lettuce wraps. Place lime juice, chile, ginger, fish sauce, honey, garlic, and cilantro in a blender. Blend until smooth. Turn blender to low speed and slowly pour in olive oil. Pour dressing over cabbage in a large bowl and toss to coat. Garnish with fresh cilantro leaves if desired. Serve immediately.